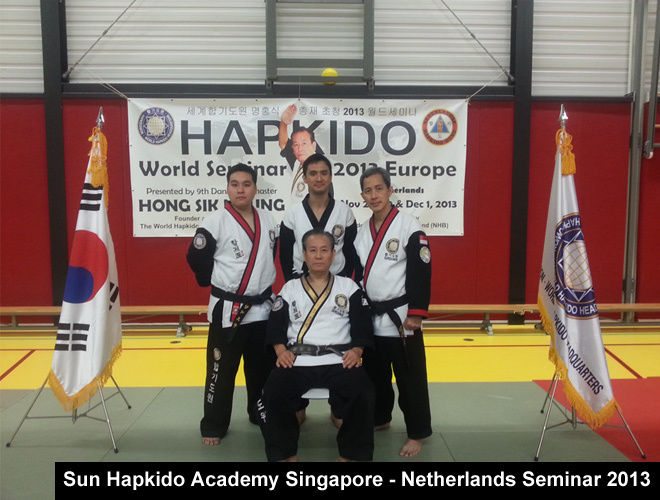 The Hapkidowon World Seminar 2013 was held from 29th November to 1st December 2013 in Netherlands. 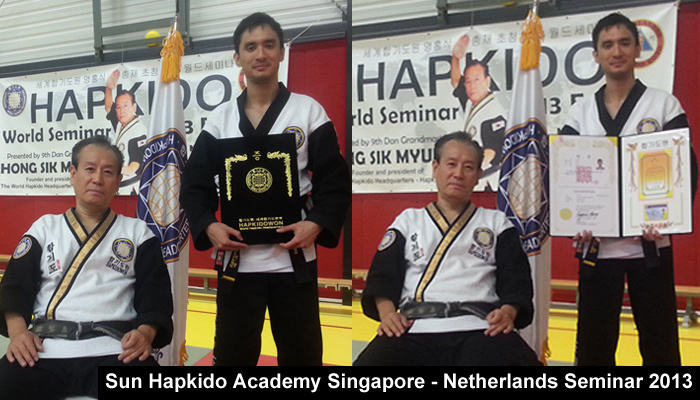 Presented by 9th Dan Grandmaster Hong Sik Myung, the seminar was organised by Master Martin Zingel of Nederlandse Hapkido Bond. I attended the seminar with Master Sng and we touched down at Amsterdam Airport Schiphol on the 27th of November 2013 at 7.05am (time in Amsterdam). Master Martin Zingel met us at the airport soon after, and we then waited for the arrival of Grandmaster Hong Sik Myung flying in from Los Angeles, California, arrival time 9.05am. We stayed at Lots4you Bed and Breakfast for the entire duration of the seminar. A sightseeing tour was also kindly organised by Master Martin Zingel where we visited many places of interest in and around Amsterdam, the notable ones being the Dutch Railway Museum, the Tropenmuseum (Museum of the Tropics) Utrecht Dom church and the St Peter’s Church in Oirschot. On the 28th November 2013, 7pm, a black belt class was held by Grandmaster Hong Sik Myung at the famous Anton Geesink Judo Dojo (Dutchman Anton Geesink, 1934 – 2010, won the Judo gold medal in the 1964 Olympics, the first non-Japanese to do so). Here, Grandmaster taught us some basic Hapkido strikes, correcting common mistakes made, and some Hapkido techniques. I was also a demonstration partner in some of Grandmaster’s techniques which gave me a valuable learning opportunity. Master Daniel Sng and I were also invited to grade during this seminar. 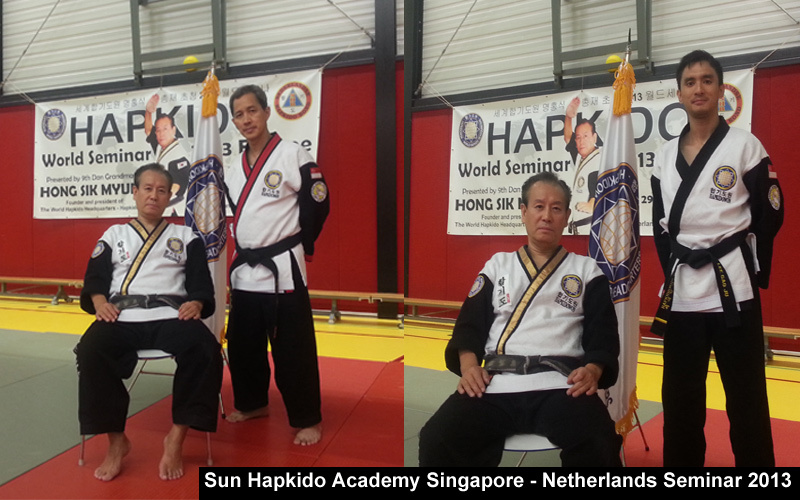 The grading was done on the 20th of November at the Dojang at Vlielandseweg 24A. 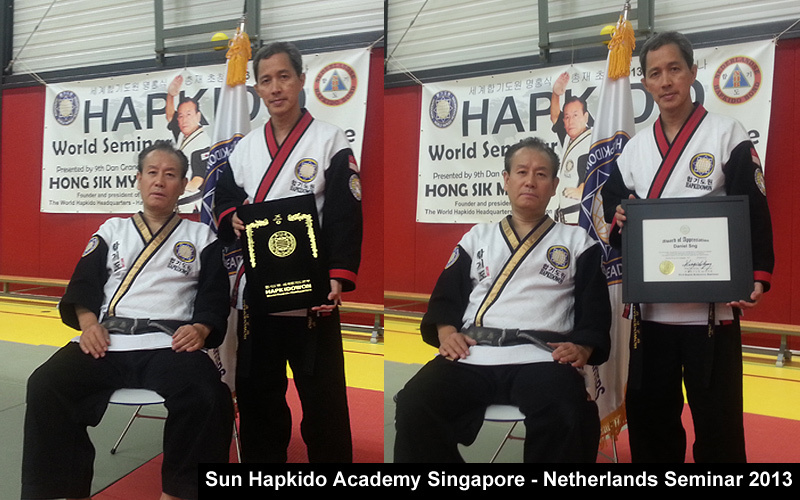 We were most honoured to be graded by Grandmaster Hong Sik Myung himself. We are also pleased to share that Master Daniel Sng has been promoted to 5th Dan and I have been promoted to 2nd Dan. We would like to thank Grandmaster Hong Sik Myung, Master Roe, Master Martin Zingel, Master Pierre van Bentum and Mr. Tom Nijholt (my grading partner) who were present at the grading. Dan certificates were handed out on 1st December 2013 during the seminar. To send your congratulatory messages to Master Daniel Sng, please click here.